Lathe Revival is building a living archive of contemporary roots music using carefully restored vintage equipment. 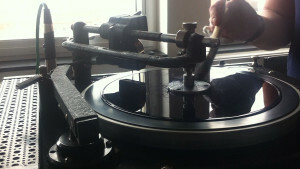 Working on a 1938 Presto recording lathe, we record contemporary musicians who are inspired by music of the past. Musicians are given a 10″ lacquer disc to cut their 78 record live in one take, using a single microphone. The audio mix is achieved through performance and positioning. The result is an authentic recording that is difficult, if not impossible to achieve with digital software. “What is your favourite album of this year?